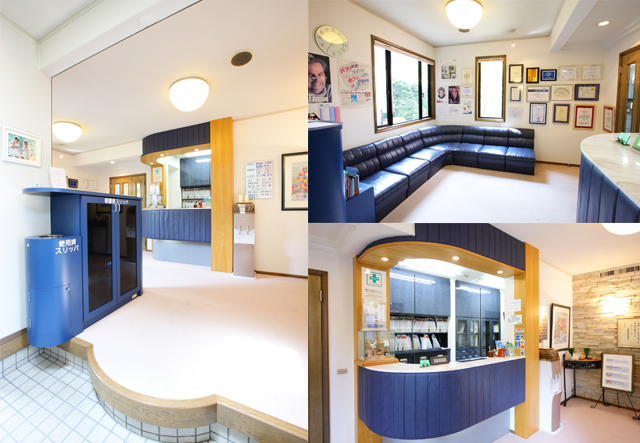 We offer a relaxing space for people seeking dental care in Tsuzuki/ Yokohama. Our office provides 4 parking spots for our patients. Our clean kept office provides a relaxed athmosphere for our patients. To keep the clinic sterile, please use the provided slippers. If you wish, we also sell disposable slippers in the reception area. Our experienced staff welcomes you with a smile and will be happy to assist each and everyone of our patients. We have set up a counseling corner for diagnosis and treatment content in each unit. Further information about implant treatment, dental treatment, aesthetic treatment etc. can be careffully discussed in the counselling room. The medical diagnosis as well as considering the desire of our patients will decide on the best course of treatment. Our treatment is based upon a thorough consultation, which doctor and patient can agree on together. There are 4 private examination booths. Each unit is equally equipped in order to offer its patients smooth treatment with no compromise. For the safety of accompanied small children, our office provides a baby bed and baby car as well as a table, chairs and toys. Our staff also assist with children from 0 years to elementary school kids. The operation room is equipped with operating lamp lights, CT, monitor, microscope, blood pressure and pulse monitor, nitrous oxide/oxygen inhalation sedation, etc. in order to provide a safe procedure. Implant treatments, removal of wisdom teeth, surgical procedures for parodontitis and orthodontic treatments, etc. take place in the operating room. Large windows and a bright, pleasant athmosphere will reduce some of your nervousness and help you relax. The Sirona Galileos CT, unlike cother onventional x-ray equipment, shows a 3D representation of the entire jaw. Due to the improved accuracy of the resulting representation, a more precise diagnosis is possible, which in turn enables a more precise treatment. The device works with the lowest radiation dose possible of 0.07 mSv, which corresponds to the German standard. The CT allows the accumulation of as much information possible before the actual therapy starts and thus can make an accurate diagnosis which enables an accurate treatment. Be one step ahead before the actual treatment starts! We would be happy to provide you with more information at any time. Copyright © 吉江歯科医院 All Right Reserved.